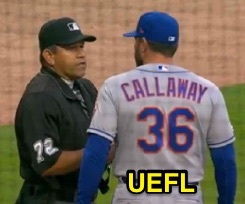 HP Umpire Alfonso Marquez ejected Mets Manager Mickey Callaway (balls/strikes; QOCY) in the bottom of the 1st inning of the Mets-Braves game. With one out and the bases loaded, Braves batter Dansby Swanson took a 3-2 fastball from Mets pitcher Jason Vargas for a called fourth ball. Replays indicate of the 19 ball calls preceding the pitching change during which Callaway was ejected, Marquez properly officiated 18 of them (94.7%), the call was correct. * At the time of Callaway's ejection, the Braves were leading, 2-0. The Braves ultimately won the contest, 11-7. 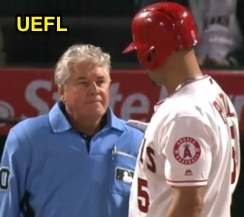 This is Alfonso Marquez (72)'s first ejection of 2019. Alfonso Marquez now has 5 points in the UEFL Standings (1 Prev + 2 MLB + 2 Correct Call = 5). Crew Chief Alfonso Marquez now has 1 point in Crew Division (0 Previous + 1 Correct Call = 1). *A UEFL Rule 6-5-c-2-a Pitching Change Exemption has been applied. 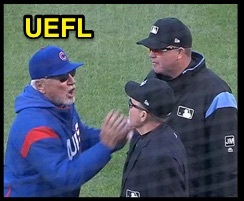 This is the 18th ejection report of the 2019 MLB regular season. This is the sixth Manager ejection of 2019. This is New York's 1st ejection of 2019, 2nd in the NL East (ATL 2; NYM 1; MIA, PHI, WAS 0). This is Mickey Callaway's first ejection since Sept 20, 2018 (DJ Reyburn; QOC = Y [Check Swing]). 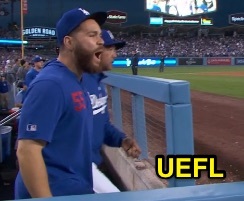 This is Alfonso Marquez's first ejection since March 19, 2019 (Carl Edwards; QOC = U [Throwing At]). 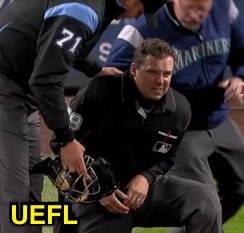 After a wild pitch knocked HP Umpire Adam Hamari to the ground in Seattle, the hobbled Hammer stuck around to observe a play at the plate, ruling the runner safe at home using his non-injured arm. With none out and Mariners baserunner Dee Gordon on second base, Astros pitcher Brad Peacock threw a 92.6-mph fastball that eluded both batter Mallex Smith's bat as well as catcher Robinson Chirinos' mitt, directly striking Hamari's left shoulder for an uncaught third strike and wild pitch that enabled batter-runner Smith to advance to first base and baserunner R2 Gordon to advance to third. But the speedy Gordon didn't stop there, sliding into home plate as Hamari staggered into position and delivered a one-handed "safe" call as crewmates Jordan Baker (U1), Todd Tichenor (U2), and Phil Cuzzi (U3) ran in from the field to check on their injured colleague. After medical attention, Hamari remained in the game, having exemplified Rule 8's General Instruction: "Keep your eye everlastingly on the ball while it is in play." 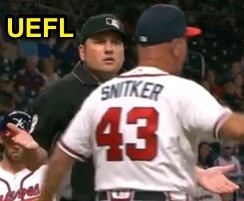 HP Umpire Dan Bellino ejected Braves Manager Brian Snitker (check swing strike two call) in the bottom of the 8th inning of the Mets-Braves game. With one out and none on, Braves batter Charlie Culberson attempted to check his swing on a 0-1 slider from Mets pitcher Jeurys Familia, ruled a swinging second strike by Bellino. 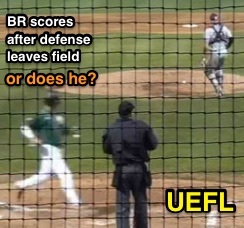 Play was reviewed and adjudicated by the UEFL Appeals Board (9-0-0), the call was correct. At the time of the ejection, the Mets were leading, 6-3. The Mets ultimately won the contest, 6-3. 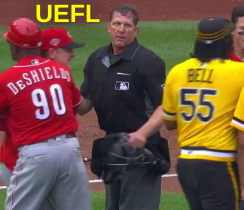 This is Dan Bellino (2)'s first ejection of 2019. 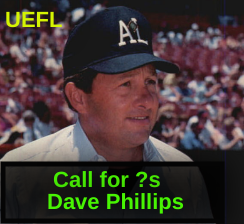 Dan Bellino now has 4 points in the UEFL Standings (0 Prev + 2 MLB + 2 Correct Call = 4). 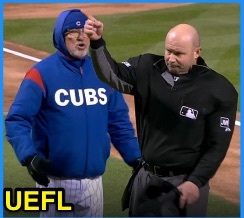 This is the 16th ejection report of the 2019 MLB regular season. This is the fifth Manager ejection of 2019. This is Atlanta's 2nd ejection of 2019, 1st in the NL East (ATL 2; MIA, NYM, PHI, WAS 0). This is Brian Snitker's first ejection since Sept 6, 2018 (Mark Ripperger; QOC = Y [Balls/Strikes]). This is Dan Bellino's first ejection since September 11, 2018 (Todd Frazier; QOC = N [Balls/Strikes]). 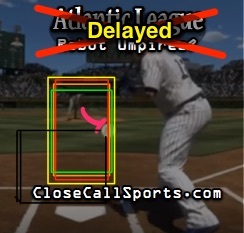 MLB and the Atlantic League will delay implementation of a computerized strike zone for pitch calling and agreed to delay changing the mound distance until 2020, announcing that robot umpires will not call balls and strikes on ALPB Opening Day as previously stated. Instead, the electronic strike zone, which will take flight as an earpiece given to home plate umpires so they can be informed of the TrackMan computer's determination of whether a pitch is a strike or ball—with the power to override the computer's suggestion—"will be implemented gradually over the course of the 2019 season," with no specific dates announced. The leagues also said that their proposal to increase the distance from home plate to the pitcher's plate by two feet, from 60'6" to 62'6", won't begin until the second half of the 2020 Atlantic League season. The pitcher's mound/rubber change had initially been slated to begin in mid-2019. 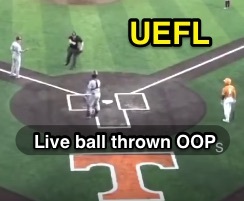 Related Post: MLB Taps Atlantic League for Reported Robot Ump Test (2/27/19). 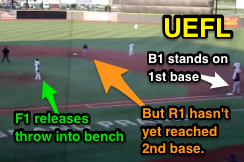 Related Post: MLB Posts Atlantic League Rules, Including Robot Ump (3/8/19). > First, second, and third base will be increased from 15" to 18-inches square. > Inning and pitching change breaks are reduced from 2:05 to 1:45. 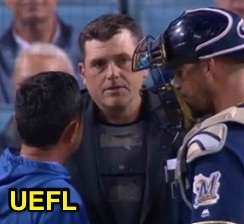 HP Umpire Tom Hallion exited Tuesday's Brewers-Angels game in California following a second-inning foul ball to the head. 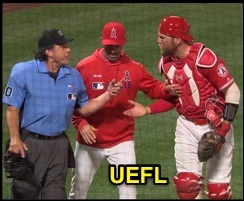 With two out, Angels batter Andrelton Simmons fouled a 2-0 90.8-mph fastball into Hallion's traditional-style facemask, knocking the mask to the ground; Hallion remained in the game for the next pitch, a force out to end the inning. During the break, Hallion left the field and was replaced behind home plate by 2B Umpire Todd Tichenor, with 1B Umpire Phil Cuzzi and 3B Umpire Adam Hamari holding their positions in the field. Cuzzi served as acting crew chief. Relevant Injury History: Hallion has a history of head injuries as a home plate umpire. Hallion last left a July 24, 2018 game in Philadelphia after a foul ball off the facemask. Related Post: Injury Scout - Tom Hallion Out on Extra Inning Foul to Jaw (7/24/18). On August 19, 2017, Hallion left a game in Baltimore following a foul ball to the top of his mask. Related Post: Injury Scout - Hallion Exits After Foul to Face Mask (8/19/17). Hallion remained in an August 2015 game after a direct hit, but left a July game after a foul-to-mask. Related Post: Tom Hallion Takes Direct Shot to Mask, Remains in Game (8/14/15). Related Post: Tom Hallion Squarely Struck by Foul, Leaves A's Game (7/1/15). Injury Scout Update: Both Jerry Layne and Scott Barry returned to the field earlier this month.